The Converse Blog: Dwyane Wade All Star Game Wade Slash. Hi All, just got word on what Dwyane Wade will be wearing in the All Star game tonight. Here is a special make up of the Wade Slash that features the navy and light bright blue of the EAST All Star jersey. This colorway won't be making it to retail, but there are 3 other colorways of the Wade Slash on sale now. 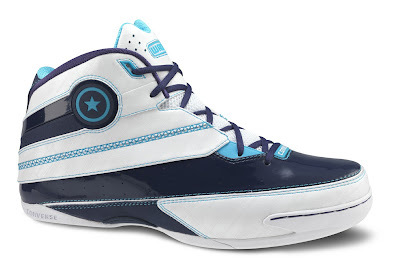 Check out Converse.com to pick a similar White/Navy colorway today. I'll post some actions pictures tomorrow. Isn't this the same one in your pic? It is the same shoe, but what Wade wore in the All Star game is in a different colorway. The All Star colorway has more navy blue in the upper and uses the light blue in more places. The All star colorway also features a white tongue where the general release has a navy tongue.